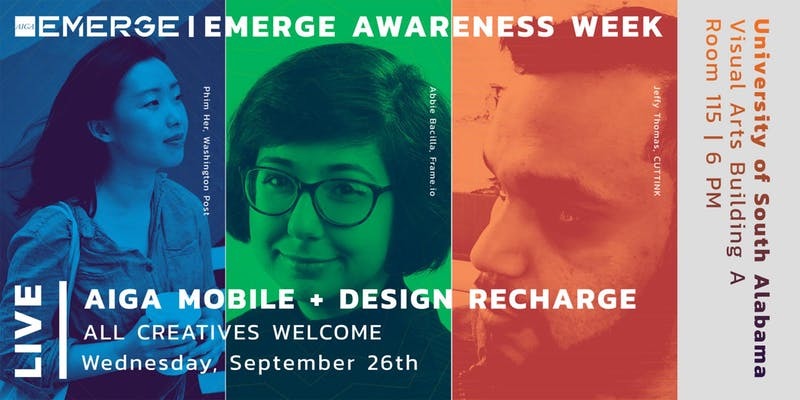 AIGA Mobile presents a special episode of Design Recharge to celebrate EMERGE Awareness Week. During this episode host Diane Gibbs will interview Jeffy Thomas (CUTTINK), Phim Her (The Washington Post), and Abbie Bacilla (Frame.io) about their career journeys and ask them questions about how they scaled their design careers. This episode will be live streamed via Zoom Webinar with interactive Q&A. Plus, for the first time Mobile area creatives will be invited to participate in person during the live recording on the University of South Alabama campus.